The Bear has a great self awareness and is also able to deliberate about choices or actions. 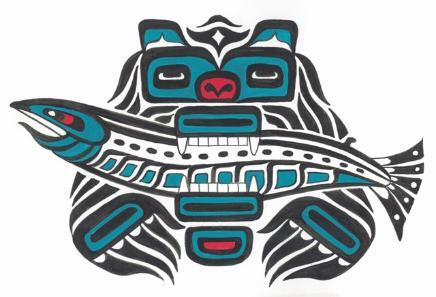 The Bear symbolizes family and strength and healing. He is one of the few animals who seek out medicines to cure his ailments. 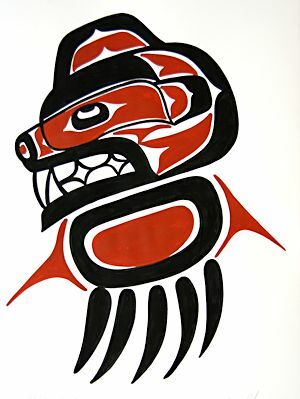 The Bear in Northwest West Coastal Native Culture represents strength and learned humility through motherhood and teaching and is an important family crest associated with family and children. Sometime referred to as the protector of the animal kingdom and forests, the Bear is a well respected member of the community and can sometimes be referred to as an elder or a person that has passed on to a new life. Some Bears return to the same den for hibernation, for which reason they are associated to home. Bears winter with their young until they are yearlings, for which reason they are associated to family. A Mother Bear will always fight to protect it’s young and can be very fierce in this situation but then can be gentle and quiet as well. Because of human traits the Bear shares, it is believed that the Bear understands human speech and thought. It has great self awareness and is also able to deliberate about choice or action. We look to the Bear to show us how to fish the salmon and collect the berries. Black Bears are depicted with a short snout, short ears, small tail, and sometimes hanging tongue. Grizzly bears have bigger teeth, particularly the canine teeth, and large claws.